Whole30 Sausage: Where to Find Compliant, Tasty Sausage! 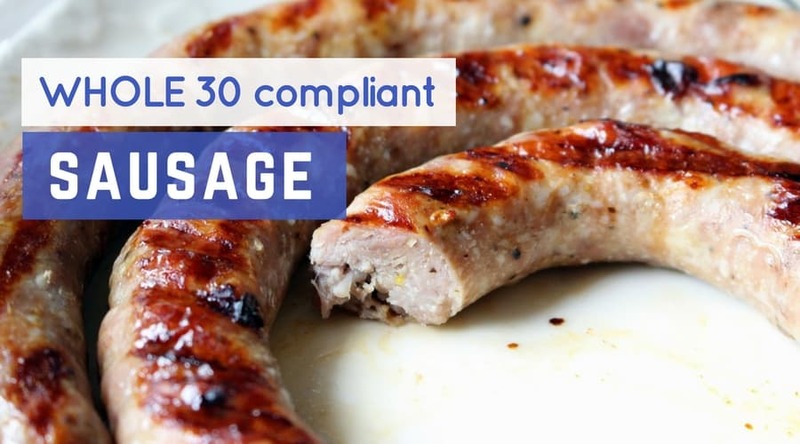 Finding Whole30 sausage can be quite a challenge – most sausages are packed with sugar and preservatives, making them unsuitable for the Whole30 program. However, there are always a few gems you can usually find, if you dig around a bit. Note: Most info from this table was taken from a Whole30 forum thread on the topic of compliant sausage. Feel free to go to the original source if you’d like. Forewarning, this list was compiled with information provided online by others – I have not been able to verify every sausage listed here. Remember, this list gives you a base to start with, but always double check ingredient lists and don’t assume because it’s on this list, that it must be compliant. Manufacturers can change ingredients or alter their branding or meat varieties, so it’s never safe to assume. That being said, if you find something in your travels that contradicts this list, please let us know in the comments so we can update it accordingly! Your Local Butcher. One awesome source for that tasty compliant meat will be your local butcher! Local butchers don’t need to put in gross additives and preservatives like grocery stores do. However, you’ll still need to ask your butcher about what’s in the meat. While most local meats don’t usually use preservatives, some still might. Same goes for sugar – different butchers use different recipes. In addition to finding meat that’s more likely to be compliant, you’ll also be supporting local businesses and building up your community! Local Farmer’s Markets: Similarly, local meat from a farmer’s market is usually sugar free and lacks the nasty additives you see elsewhere. Again, ask to be sure. Whole Foods Meat Case. The meat case at Whole Foods is another great spot for compliant meat, such as bratwurst, chorizo, and andouille sausage. U.S. Wellness Meats. We mentioned it above in our chart, but U.S. Wellness Meats is one of the few official go-to sources for Whole30-approved meat online. They’ve got a great selection from sugar free pork bacon to sugar free breakfast sausage! You’ll recognize compliant meats by their simple ingredient list (at least compared to their non-compliant cousins). Whole30 meats will just contain meat, water, and some minor spices. Sugar. If you see sugar on a sausage ingredient, it’s automatically out, no questions asked. It doesn’t matter if it’s organic cane sugar, maple syrup, or some other harmless-sounding sweetener. Any sugar listed means that meat is a no-go. Sulfites. Sulfites are used as preservatives and are not allowed on Whole30. Unfortunately, many deli meats contain sulfites to preserve meat longer. Carageenan. Carageenan is an emulsifier (aka thickener) that can cause serious inflammation in the gut, which is why it’s not allowed on Whole30. Soy / Soy Protein. Don’t forget, soy is another ingredient where you’ll want to put down that package the moment you see it! Dextrose. Dextrose is simply another name for sugar (that crafty devil has too many monikers to count). I’ve seen dextrose on quite a few sausage ingredient lists, so it’s worth repeating! Cheese and/or Milk. Some sausages (especially the fancier varieties) contain dairy for added flavor. Obviously, these aren’t allowed! Note: “Salt Dextrose” is different from regular dextrose, since all iodized salt contains it (the dextrose helps the iodine bind to the salt). For a full list of what additives to avoid (and which to not freak out too much about), check out the amazing official Whole30 Additive Cheat Sheet. The easiest way to get your hands on some Whole30 sausage will probably be to make your own! Here are a few helpful recipes for creating your own compliant sausages for the Whole30 program. Description: This quick and easy recipe for breakfast sausage only takes 10 minutes to cook up! Description: This DIY italian sausage seasoning recipe lets you whip up a batch of seasoning that can be added to any ground meat! What’s your favorite variety of Whole30-friendly sausage? Tell us in the comments! If no sugar is allowed in meat, i.e., bacon, sausage, etc., how can this work with fruits that are loaded with natural sugar? Hey Ellen – natural sugars like those found in fruit are ok – no added sugars are allowed. The ingredient list I found online for that product shows that it contains corn syrup, among other ingredients that are not allowed on Whole30. It’s easiest to just check the ingredient list in person and see. Balsamic vinegar is fine, so long as it has no added sulfates or added sugar. Naturally occurring are ok.
Balsamic vinegar is fine, so long as there are no added sugars or added sulfates. Naturally occurring are ok.
Should be ok so long as no added sugars or gluten. Check ingredients. Thank you, I can say this, just one week and I’m sleeping better then I have in years. My sushi consumption consists of protein rolls and hand rolls without rice, yum! Dates with almonds rolled in coconut and apple sauce w/o sugars, are they ok? Hi Bill. My husband and I are at day 11 of whole 30. I had bought some apple sauce and canned pumpkin and had some sweet potatoes. I used the extra baked sweet potatoes (yams-the orange fleshed ones with purple skin) (2) and masked them with a few cups unsweetened canned pumpkin, added about a cup of apple sauce, and some raisins. I cooked it and mashed together in the saucepan, along with cinnamon , a dash or two of allspice. My husband loved it . We are it for breakfast with a fried egg. Good luck on your whole30. What about the new Taco Bell Chicken Shell, as far as ingredients? I’m sure nothing from Taco Bell is compliant. Apple Sauce w no added sugar can be ok – you’ll need to check ingredients though. In Northern California we also have Tavarites brand sausage. They make a great hot Italian – I often have a link with breakfast. I purchase many proteins from Wellness Meats – bacon, sausage, ham, and some poultry. All of them are W30 compliant and their customer service can’t be beat. I’ve never regretted any buying from them.